If I was a smarter blogger, I would’ve posted a good old-fashioned downloadable back-to-school menu for you today (like I did when I was my best blogger self back in 2013) complete with strategies, under-30-minute tricks, and cook-once-eat-twice kind of ideas that make up the backbone of family cooking. You have my word that I will try to be smarter tomorrow. 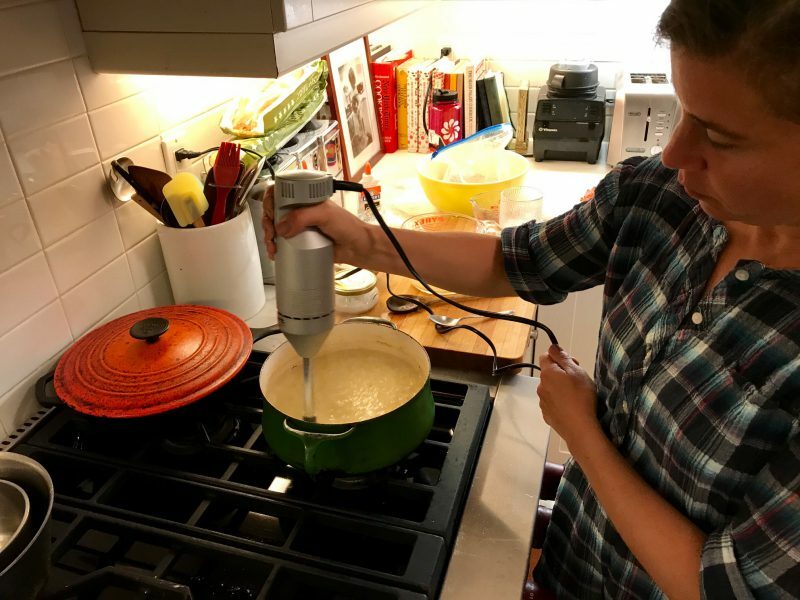 For now, I feel a strong urge to tell you about the corn chowder I made on Sunday night, which really felt like Saturday night because of Labor Day and because the kids had a houseful of friends. It poured all day in New York and I don’t think the mercury tipped past 65 — not exactly the most romantic way to send off summer. Instead of optimizing the neighborhood pool’s last open weekend, or the backyard Weber for that matter, I was inside wearing slippers making soup. Not chilled soup. Hot soup. At least it was hot soup that included fresh, sweet, summer corn, which any minute now is going to go the way of the pool and the Weber, i.e. gone. I came home from the market with a bushel of ears and since I didn’t really have a plan for them, I did what I usually do in these situations: I pulled down Michael Anthony’s V is for Vegetables from the shelf. He had a recipe for a beautiful silky corn soup made with coconut milk which looked delicious, but it was a single ingredient in the recipe that intrigued me more: corn stock. Anthony is the world-renowned chef at Gramercy Tavern, but world-renowned or not, he’s a chef, which most likely means he is obsessed with squeezing every last bit of flavor out of everything that comes through his kitchen. 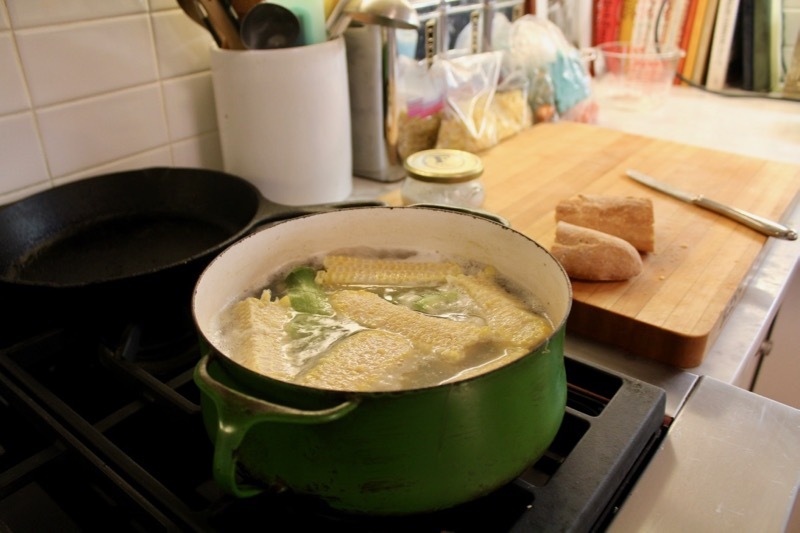 In the case of corn, this translated to boiling the skinned cobs in water with aromatics and salt to create a sweet, milky corn-concentrated stock. And yes, “corn-concentrated” are the two words you need to hear most in this world when it’s early September in New York. How I ultimately ended up using it as the launching point for corn chowder with shrimp, I’m not really sure, though I’d be willing to bet some New England vacationer I follow on instagram or Facebook posted a photo that lodged deep into the pleasure center of my memory. Who knows how I got there — the important thing is that I got there. The stock not only doubled down on the corn flavor, but the milky starchiness added a natural thickness. I was all set to drizzle in a little cream into the soup at the end, but I didn’t because it was completely unnecessary. And true, while the recipe isn’t exactly a quick-and-dirty weeknight dinner (you know I don’t usually ask you to make your own stock on a Tuesday) it was something I wanted to make sure I shared before the corn window of opportunity closed. Whether that’s tonight or this weekend. This is a riff on a stock from Michael Anthony’s V is for Vegetables. In his recipe, he also calls for 1 stalk lemongrass, halved and 3 thin slices fresh ginger, which felt right for a stock that would be added to a coconut milk-based soup. 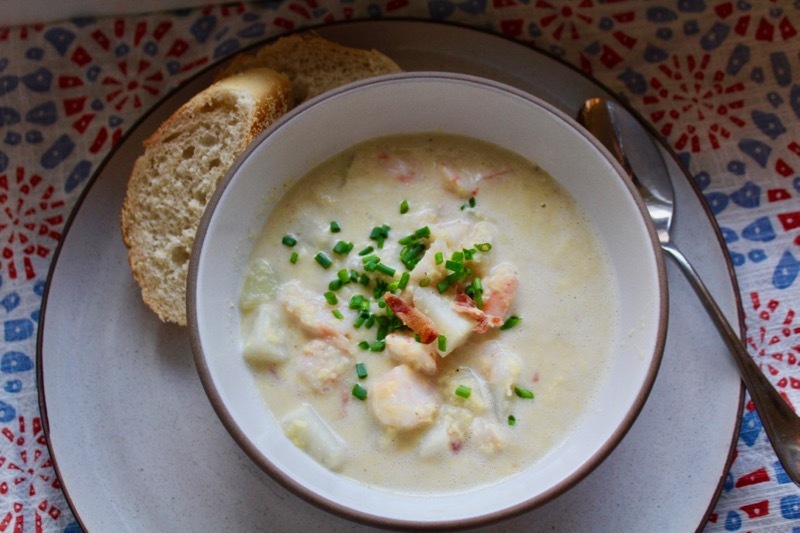 For a basic chowder, though, I kept mine simple. Cut the corncobs into pieces. Combine cobs, leek, and garlic with 3 cups of water and simmer in a medium saucepan for about 20 minutes. Stir in salt, then strain. Corn stock keeps, covered in the refrigerator, for up to 5 days or frozen for about 3 months. I struggled with the right way to incorporate the cooked potatoes and shrimp without using a hundred pots. (Since this gets a puree, they need to be added late in the game, after the cooking has been done.) I could’ve just called for “cooked shrimp” and “boiled potatoes” and feel free to add shortcuts wherever you see fit, but figured I’d incorporate every step in here so you’d know what you were in for. Add potatoes to a medium saucepan and cover with water by about 2 inches. (You will use this water to boil your shrimp, so keep that water level in mind.) Simmer until cooked through, about 10 minutes. Using a slotted spoon, remove potatoes to a bowl and add shrimp to the same hot water. Simmer until cooked through about 3 minutes. Drain and set aside. In a medium soup pot over medium heat, cook bacon until crisp and fat renders. Remove and chop into pieces. Add oil, leeks, red pepper flakes, salt and pepper to the pot, and sauté until leeks are softened. Add garlic, cook for one minute, then corn kernels, tossing to coat in oil. Add corn stock and chicken stock. Bring to a boil, then simmer for 10 minutes. Turn off heat. Using an an immersion blender, process until smooth. (You can also process in a blender, but if you do this please make sure the soup has cooled almost completely or else you might have an exploding blender situation on your hands.) Stir in Worcestershire sauce, cooked potatoes and shrimp and heat until everything is warmed through. Serve in bowls topped with bacon bits, herbs, and baguette slices. Jenny – we stopped at the Hastings Farmer’s Market on our way to Beacon this weekend (thanks to your Westchester guide!). Did you try the Wild Culture waffles yet? So good, and I love that couple and little Lola! Thanks for this recipe. so glad you went! Never had a Wild Culture waffle so will have to remedy asap. Thanks for the tip. Looks delicious, Jenny. How many will it feed? Just wondering if I need to double. About four with a little bit left over for lunch the next day. I can’t wait to make soups again. It was 110 this weekend with some smokey air from a near by fire. (plus our school has been in session for 3 weeks) California is weird. This is going in my must make. I made this today and it turned out so well. It was so creamy and sweet and the perfect way to use up some of the last of the summer corn. I did find the corn stock to be very salty with the ratio of 1 tablespoon to 3 cups water. It might’ve just been my palate but I would probably reduce it to 1/2 teaspoon – 1 teaspoon next time. Otherwise, worth the multiple dishes! Wow- shrimp, corn and potato soup must be in the zeitgeist– I made a similar version yesterday but added a can of tomatoes and some minced chipotle peppers. I just walked into the market and the idea stuck me. Funny! I am finding some recipes about corn for autumn and thank God I find them in your blog. I can not wait to try your recipe right now. I tried to make corn milk but it is not good as I expect. Do you have recipe for corn milk? This is dinner tonight! Never, ever thought I’d be making corn broth , thank you for taking me there anyway. This soup smells and tastes fantastic! Nice work, Jenny. Look delicious.